Posted by admin in NASA Earth Observatory, Red Sea, Yemen. Volcanoes reshape the surface of the Earth all the time , but their influence is demonstrated in particularly dramatic form when new islands are created by volcanic activity. There’s been an interesting example this kind of event over the new year in the southern Red Sea, among the Zubair islands off the west coast of Yemen. The eruption seems to have begun on or around 19 December 2011 and to have lasted for nearly a month, ceasing by 15 January 2012, by which time a new island had been added to the Zubair archipelago (‘Throw away that shiny new atlas you got for Christmas – it’s already out of date’, was the engaging comment of the New Scientist‘s ‘Short Sharp Science’ blog). This event was well reported by Erik Klemetti at Eruptions and Joe Bauwens (who, like me, has studied geosciences with the Open University) at Sciency Thoughts, and I have given links to their reports below. The main point of this post is to showcase the wonderful images of the eruption available through the NASA Earth Observatory. The following images trace the progress of the eruption from late December: in each case click on the image to go to the original report at the Earth Observatory. 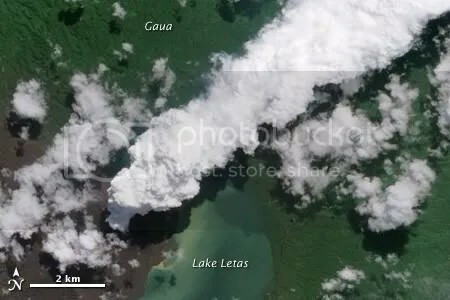 This image was captured by the Advanced Land Imager on NASA’s EO-1 satellite on 23 December 2011, a few days after the eruption was first observed. A thick plume can be seen rising from the new island created by the volcanic activity. 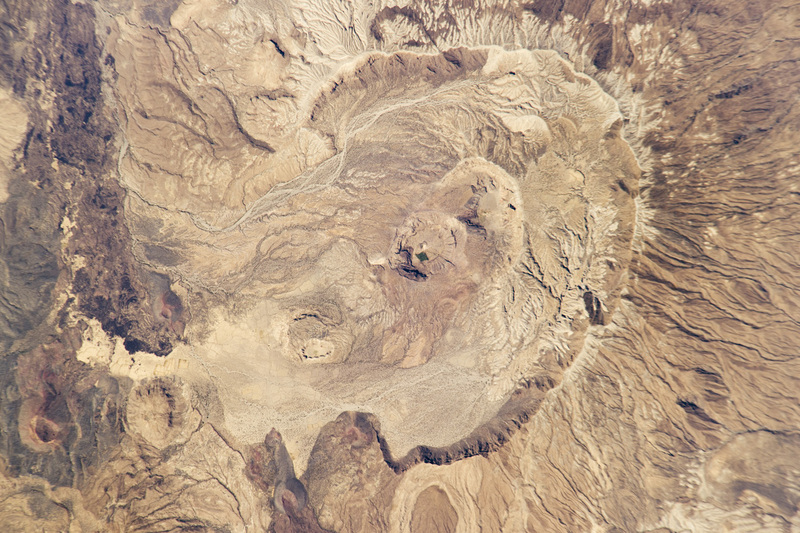 A detail view from another EO-1 ALI image, this one captured on 7 January 2012, shows that the newly-created island has grown in size, with steam and ash (and considerable sulphur dioxide) streaming away northwards. On 15 January 2012 the EO-1 ALI captured this image of the new island, showing that the eruptive activity had ceased by this date. This detail from an image captured by the Enhanced Thematic Mapper Plus (ETM+) on Landsat-7 shows the new addition to the archipelago, crater clearly visible (with perhaps a small crater lake inside it), on 15 February 2012. The Red Sea is a very tectonically active place. Here the African and Arabian plates are pulling away from each other and new oceanic crust is being created. The rifts associated with this process feed the volcanism of Eritrea and Ethiopia on the western side of the Red Sea and that of the Arabian peninsula on the eastern side, as well as the volcanic activity beneath the Red Sea itself that sometimes breaks the surface in the form of islands. Posted by admin in Es Safa, Middle East, NASA Earth Observatory, Syria. For various reasons ranging from the geographical to the geopolitical the volcanoes of the Middle East are relatively little-known, so it’s always interesting to find out more about the volcanic features of such countries as Saudi Arabia, Yemen, Afghanistan and Syria. The NASA Earth Observatory is featuring a volcanic field from Syria as its Image of the Day for 20 September 2010: the Es Safa Volcanic Field, which is in southern Syria, about 80 km east of Damascus. Rather surprisingly there is no scale with the image, but the area shown is 45 km x 30 km, and the width of the lava field in the centre of the image measured from north-west to south-east (north is top left in this image) is about 17 km.